Colin Jones (NCAS) and the UKESM core group. As discussed in the 5th UKESM Newsletter (Sellar et al. 2017, Parameter tuning for UKESM1), over the past 12 months we have been working intensively on the scientific calibration of UKESM1, an important and necessary final step when a set of complex component models are coupled together into a fully coupled Earth system model (ESM). This calibration effort is now largely complete and the 1st version of UKESM1 will be ready for scientific use in January 2018. At this point the UKESM core group will launch the first set of UKESM1 simulations contributing to the 6th Coupled Model Intercomparison Project (CMIP6). These simulations, referred to as the CMIP DECK (Eyring et al. 2016), have already begun with the physical core of UKESM1, namely HadGEM3-GC3.1 at N96/ORCA1 resolution (referred to as GC31 hereafter) and are reported elsewhere in this newsletter (Kuhlbrodt et al. 2017). Subsequent to starting the CMIP6 DECK, the core group will then ensure UKESM1 is made available to the wider UK research community for their individual research use. Here we follow up on where the report of Sellar et al. 2017 ended to illustrate the type of (calibration/tuning) challenges we have been addressing in the final stages of developing UKESM1. We discuss how the radiation bias, presented and un-remedied at the time of that article, has now been corrected (or rather reduced). Combined with the remedying of other, similar biases that appeared as the UKESM1 component models were progressively coupled together, we have now reached a position where the present UKESM prototype model (UKESM0.9.4) is performing sufficiently well to be released for active scientific use by the UK research community. Below we reproduce figure 1 from the Sellar et al. 2017 article, which shows one of the biases in UKESM0.6 being addressed at the time that article was written. This bias manifested itself as a broad area of the continental Northern Hemisphere mid-latitudes not reflecting sufficient amounts of solar radiation in the winter months, compared to both the parent physical model (GC31) and satellite observations. This lack of solar reflection was traced to the land surface in these regions being not sufficiently reflective and was thought to be a result of one important difference between UKESM and GC31; namely UKESM dynamically predicts the surface vegetation type and cover, whereas these are externally prescribed based on observations in GC31. In particular, it was thought that differences in predicted vegetation type and cover in UKESM0.6, and their interaction with accumulating winter snow in the regions in question, was the cause of the large differences in winter surface reflectivity seen between the 2 models. This bias in reflectivity leads to excess absorption of solar radiation at the surface and a warm bias in winter and spring surface temperatures. The bias is self-amplifying through the fact that excess absorption of solar radiation at the surface also causes snow to melt more rapidly than observed, further reducing the surface reflectivity. Furthermore, the large spatial extent of the energy bias associated with this error was shown to impact a number of other, planetary scale, phenomena in UKESM0.6. As an example, tests running UKESM0.6 with vegetation prescribed to be the same as GC31 indicated that this surface radiation bias caused a ~20% reduction in the strength of the Atlantic Meridional Overturning Circulation (AMOC) in the model. Hence it was deemed critical to reduce this surface reflectivity bias before UKESM could be deemed fit for purpose. Figure 1. 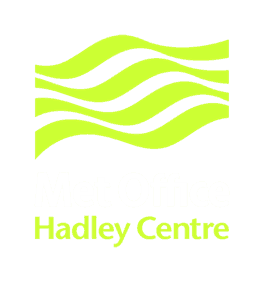 Top of atmosphere clear-sky outgoing shortwave radiation (Dec-Jan-Feb average) for UKESM0.6 and HadGEM3-GC3.1. a) UKESM0.6. b) Difference between UKESM0.6 and GC31. c) GC31 errors against CERES-EBAF satellite observations. d) UKESM0.6 errors against the same observations. After a large amount of analysis the cause of the difference in Figure 1 was narrowed down to the definition of a model parameter, known as “the Leaf Area Index” or LAI and the interaction of LAI with snow accumulating through the model simulated winter. LAI is largely a model-based parameter that describes the degree to which a given simulated vegetation type interacts with model energy fluxes, such as solar radiation. Roughly speaking, the larger the value of LAI, the greater amount of foliage a vegetation type is assumed to have and the greater its interaction with solar radiation (e.g. reflection or absorption). The total reflectivity (or albedo) of vegetation varies by type and growth through the annual cycle, but lies in the approximate range ~10 to 30%. As snow accumulates on the ground (in both the real and model world), vegetation is gradually buried and the surface reflectivity rapidly increases towards much higher snow values, going from an initial surface vegetation value, through one that is a mixture of snow and protruding vegetation (~30-60%) to finally reach the high snow albedo values (~70-90%). The rate of this transition depends both on the amount of snow accumulating on the ground and the type of vegetation on to which the snow falls. In GC31 vegetation type and distribution are externally prescribed, combined with this an annual cycle of LAI is assigned to each prescribed vegetation type. 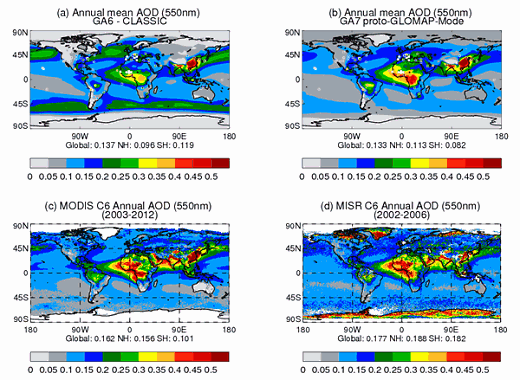 These LAI values are based on satellite observations. Hence, in regions and periods of the year that are snow covered, the prescribed LAI implicitly includes the impact of accumulating snow cover on the seasonal variation of LAI. Thus, in GC31 the parameterization that describes the impact of accumulating snow on the grid box mean surface albedo in vegetated regions is not required (or is largely inactive), as the impact of snow cover is already included in the prescribed LAI. One can argue that the prescribed LAI in GC31 is not really an LAI for vegetation, rather in regions and periods of snow cover, it is an LAI representative of the combined snow cover and (progressively buried) vegetation. 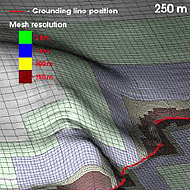 In UKESM0.6, vegetation type, spatial cover and foliage are all dynamically predicted. Hence, in winter the LAI of a given vegetation is the model’s best estimate of that vegetation’s actual LAI, without any inclusion of the impact of snow cover. In UKESM0.6, therefore, the parameterization describing the impact of accumulating snow on the total grid box mean (combined vegetation and snow cover) surface albedo becomes critical for an accurate simulation of the annual cycle of total surface reflectivity. As a result of the implicit inclusion of snow effects on vegetation in GC31, this particular parameterization which is also used in UKESM, is not sufficiently active in terms of the impact accumulating snow has on surface reflectivity when more realistic vegetation LAI values (as simulated by UKESM0.6) interact with the model’s snow scheme. The result in UKESM0.6 is a negative bias in surface reflectivity (too low reflectivity) due to an underestimate of the impact of accumulating snow in vegetated areas on total surface reflectivity. Modifications of this parameterization, particularly with respect to the interaction of accumulating snow with broadleaf trees and shrubs, increasing the rate at which vegetation, in terms of its interaction with downwelling solar radiation, is buried by snow, led to a dramatic reduction in the model solar reflectivity bias. This can be seen in figure 2, which plots the same quantity as in figure 1 (top of atmosphere outgoing solar radiation (OSR) in clear sky conditions during boreal winter). The top right panel shows the increase in OSR when the parameterization for the impact of accumulating snow on vegetated LAI is modified versus prior to this modification. 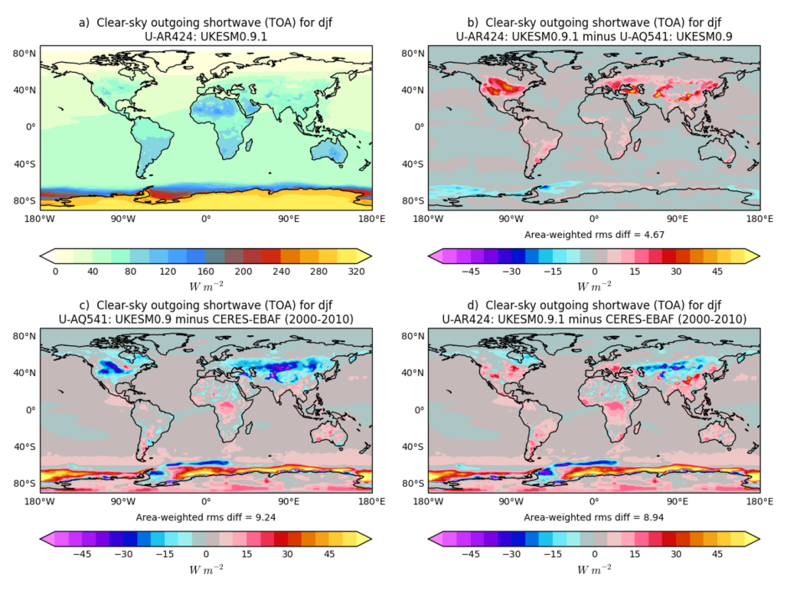 To a large extent the area of increased clear sky OSR in figure 2 (red coloured areas in the mid latitude Northern Hemisphere with increased OSR values of ~20Wm-2) is a mirror image of the UKESM0.6 error in figure 1. The lower panels in figure 2 show the bias in clear sky OSR compared to satellite-based observations. The lower left shows UKESM0.9 before the snow-LAI modification and lower right (UKESM0.9.1) after the modification. While not all of the OSR bias is removed, there is a very significant improvement in the regions of of concern. Improvements of a smaller magnitude are also seen in the Northern Hemisphere autumn and spring, again due to an improved representation of the interaction between accumulating snow and vegetation and their combined impact on downwelling solar radiation. Figure 2. As Figure 1, but (b) UKESM0.9.1 – UKESM0.9, (c) UKESM0.9 – EBAF (d) UKESM0.9.1 – EBAF. Reduction of the winter surface reflectivity bias in UKESM0.9.1, as expected, led to near surface temperatures across wide swathes of the Northern Hemisphere becoming warmer, particularly in boreal winter and summer. This was deemed an improvement. Perhaps more surprisingly, the ~20% reduction in the strength of the AMOC between GC31 (~16 Sverdrups in strength) and UKESM0.6 (~13 Sverdrups strength) was also remedied by correcting the surface reflectivity problem, with the AMOC in UKESM0.9.1 now of similar strength to GC31. Improvements to the AMOC also had a significant (and positive) impact on Arctic sea ice thickness as simulated in UKESM0.9.1. Eyring, V., S. Bony, G. A. Meehl, C. A. Senior, B. Stevens, R. J. Stouffer, and K. E. Taylor (2016), Overview of the Coupled Model Intercomparison Project Phase 6 (CMIP6) experimental design and organization, Geoscientific Model Development, 9(5), 1937-1958, doi: 10.5194/gmd-9-1937-2016. Alistair Sellar et al. Parameter tuning for UKESM1, UKESM Newsletter no. 5, June 2017. Till Kuhlbrodt and Colin Jones. Starting the CMIP6 simulations with HadGEM3 GC3.1. UKESM Newsletter no. 6, December 2017.